In the 16th century, Ivan the Terrible ordered the building of the Cathedral of the Protecting Veil, or the Church of Saint Vasily the Blessed (Saint Basil in English) to commemorate the capture of Kazan and Astrakhan. According to legend, Ivan had the architect blinded so that he could not create a more beautiful building. The story is somewhat doubtful, but the beauty is not exaggerated. St. Basil's stands just outside the Kremlin walls, at the far end of Red Square. When you enter the square from the typical entrance to the north, St. 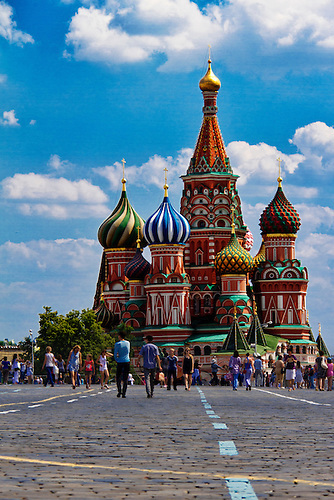 Basil's rises up in the distance, across the huge stretch of the square, like something out of a fairy tale. The cathedral is actually eight churches arranged around a ninth central church. The building's design is unlike anything else in Russian architecture. The cathedral was originally all white. It must have been beautiful that way too, but it's hard to imagine. The color was added in the 17th century. The cathedral was secularized in 1929 and remains the property of the Russian Federation, serving as a historical museum.